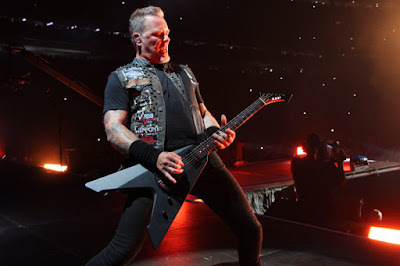 Metallica are sharing video of pair of tracks off their classic 1986 album, “Master Of Puppets,” from their August 20 show at the new U.S. Bank Stadium in Minneapolis, MN. Released just two days prior to the concert, “Hardwired” secured enough attention and radio airplay to make its debut at No.2 on the US Billboard + Twitter Top Tracks chart and at No. 18 on the Mainstream Rock Songs airplay chart after less than three days of airplay. Metallica streamed audio of the full Minneapolis concert and it can be heard here. Metallica are planning an extensive US tour in support of the project, with dates expected to start in January 2017. "It's time to come back," says Ulrich, "and do some proper penetration of America."